To commemorate the 100th anniversary of Bill Monroe’s birth and extraordinary life, Saga Musical Instruments introduces the Limited Edition Kentucky Master F-model Mandolins. This Centennial mandolin will feature a special pearl-inlaid likeness of Bill above a banner commemorating this hundred-year milestone and his signature in gold script below. Only the finest, most deeply-figured Michigan maple and the choicest Adirondack spruce will be used for the back, sides, neck and top – each harvested from exactly the same forests that supplied the original wood used in the 1923 Master Mandolin that Monroe played for most of his career. We believe that this exceptional mandolin is a fitting tribute to the man who invented Bluegrass, and every professional mandolin player, fan of Bill Monroe and his music, and every instrument collector will want this exclusive, limited-edition masterpiece. >Solid, hand-carved and graduated select Adirondack Spruce Top. >Solid, flat-sawn, hand-carved select Flamed Maple back and sides from Northern Michigan. >One-piece maple neck with dovetail neck/body joint at the 15th fret. >Delicately shaded vintage sunburst finish. >Ebony fingerboard with M.O.P. dot position markers and 29 fret extension over the body. >Ivoroid binding with side purfling. in Pearl with his signature in gold wire. >Vintage-style ebony bridge with small adjustment wheels. 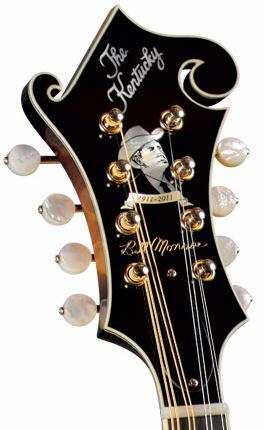 >Traditional 2-screw truss rod cover plate. >Gold-plated, engraved tail-piece with leather insert. >High-quality, gold-plated Gotoh tuners with engraved plate and removable pearl buttons. >A deluxe repro oblong mandolin case and cover included. >And a Limited Edition certificate of authenticity signed by Bill's son, James Monroe!